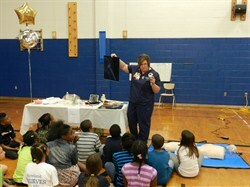 Students at Greenview Upper Elementary School attended the fifth annual Career and College Fair on Thursday, May 23rd. The informative and interactive event featured nine presenters, many of them parents of students who attend Greenview, representing various career fields, as well as higher education institutions. The occupations of the presenters included an orthopedic nurse, cyber investigator, pre-school teacher, and a bathroom and kitchen designer. During the event, groups of students rotated visiting each presenter’s table, where they learned about the education, skills and technology involved in each profession. Students also had the opportunity to ask each presenter questions about their profession, as well as interact with videos and other visual aids. Thanks to all of the presenters for helping to make the Career and College Fair a success!